St. Martin's Griffin, 9781250029027, 336pp. In 1852, when prestigious Alabama plantation owner Cornelius Allen gives his daughter Clarissa's hand in marriage, she takes with her a gift: Sarah—her slave and her half-sister. Raised by an educated mother, Clarissa is not the proper Southern belle she appears to be, with ambitions of loving whom she chooses. Sarah equally hides behind the façade of being a docile house slave as she plots to escape. Both women bring these tumultuous secrets and desires with them to their new home, igniting events that spiral into a tale beyond what you ever imagined possible. 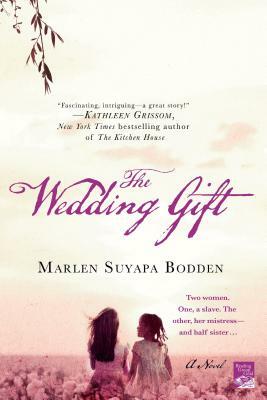 Told through the alternating viewpoints of Sarah and Theodora Allen, Cornelius' wife, Marlen Suyapa Bodden's The Wedding Gift is an intimate portrait of slavery and the 19th Century South that will leave readers breathless.